While Windjammer Days in Boothbay Harbor offers a week full of events, it is the Windjammers who we have gathered to celebrate. They are each a vessel of living history and their entrance into the harbor each June is not only treasured by those who turn out year after year to watch, but they are also revered and respected for keeping an important piece of our past as part of our present. 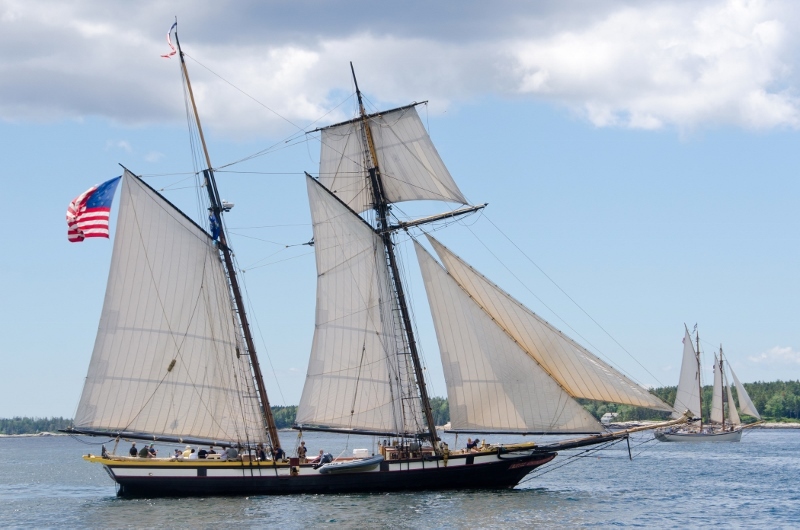 The Windjammers will gather off Cabbage Island to begin their glide into Boothbay Harbor under full sail. They will start arriving shortly after 1 pm. You can view them from both the east and west side of the harbor including Whale park, the Footbridge, Fisherman's Memorial, as well as the Aquarium on McKown Point just to name a few spots. New this year, we will have a drone sending live footage to a large screen in Whale Park. Some of bigger schooners will need to stay in the outer harbor while others will come in and anchor. The best way to see all of the schooners is to take in one of the many boat tours offered that day. You can learn about the different trips below. To learn more about each of the participating schooners, please visit our Windjammers page. We are fortunate enough to have Schooner Eastwind call Boothbay Harbor home and she is here for your enjoyment the entire season. We are also grateful to all of those schooners who make the journey to join us for this special celebration year after year. Some of them stay around a bit longer than others. For the ones who must leave right away, we are sad to see them depart as our time with them is so short, but it is a beautiful thing to see them get underway in the early morning calm. You can bid them farewell as they depart the harbor. There are plenty of opportunities to get out on the water for a closer look at these windjammers and beautiful Boothbay Harbor. Check out the boat tours to see who is headed out. If you would like get a tour of Schooners Adventure and Harvey Gamage while in port, check out their reception event on Friday, June 29, 2018.